If you have a lot of loose or sagging skin on the stomach, you may well be a suitable candidate for abdominoplasty. After extreme weight loss, either through controlled diet or post-pregnancy, the skin may lose some of its resilience and elasticity, and therefore unable to recover properly from being stretched. This can lead to loose skin, which can often form an ‘apron’ of excess on the stomach. Patients with this problem are the ideal candidates for abdominoplasty. Depending on the severity of your case, you may be more suited to a mini or a full abdominoplasty – this will be discussed with you during your consultation. Will abdominoplasty help me to lose weight? Although abdominoplasty can remove some stubborn or excess fat, it is not a weight loss surgery. If you are very overweight, abdominoplasty surgery is probably not suitable and you might be a more suitable candidate for weight loss surgery. If you have little to moderate excess weight but are mainly concerned with your excess skin, you might still be a suitable candidate for abdominoplasty. What anaesthetic is required for abdominoplasty? Abdominoplasty is performed under general anaesthetic, meaning you will be asleep for your surgery. I work with highly experienced anaesthetists, with whom he has worked for many years, to ensure your utmost safety during your procedure. What does abdominoplasty surgery entail? Abdominoplasty surgery generally takes around two hours, although this varies from patient to patient. During the procedure, I will make a horizontal incision that runs from hip to hip, the skin is elevated and usually, the muscles are tightened to help flatten the abdomen further. The excess skin and fat is then removed. The incision will be closed, and a compression garment will be applied. What scarring does abdominoplasty leave? Unfortunately, scarring is more or less unavoidable in abdominoplasty surgery. A horizontal scar will be left on the lower abdomen, and although it will fade over time, it is unlikely to disappear completely but usually, after 1 to 2 years, it should be a pale white line. Scarring will also differ between patients, depending on their skin colour, skin type and the nature of the surgery – i.e. how much skin there is to remove. I will discuss your individual circumstances with you during your consultation. What is the aftercare for abdominoplasty? After abdominoplasty, you will have to stay in the hospital for one or two nights to allow your recovery to get underway. After you are allowed to return home, you should take at least 1-2 weeks off work and should not resume any strenuous activities like a sport for 6 weeks after your surgery. Bruising is normal after abdominoplasty and may take a couple of weeks to subside. You should wear the compression garment provided to you by the cosmetic nurse for at least six weeks after surgery. As with any surgery, abdominoplasty does carry some risk and potential side-effects, and this should be carefully considered before undergoing treatment. You can expect some bruising, swelling and bleeding after surgery, as well as some mild discomfort, although this can be managed with mild painkillers that will be prescribed to you. There is also the risk of infection following surgery, but antibiotics are given in order to minimise the risk. Delayed healing of the wound may occur especially in overweight patients and in smokers. Therefore, it is important to lose weight and stop smoking prior to surgery. How do I find out more about abdominoplasty? To discover more about abdominoplasty surgery, call the clinic to book a consultation with me. Here, you will be able to discuss the surgery at length. After assessing your individual circumstances, I will be able to manage your expectations from the surgery and give you an idea of the likely result to be expected along with a discussion of the risks. It also gives us an opportunity to speak and build a rapport before surgery is performed. 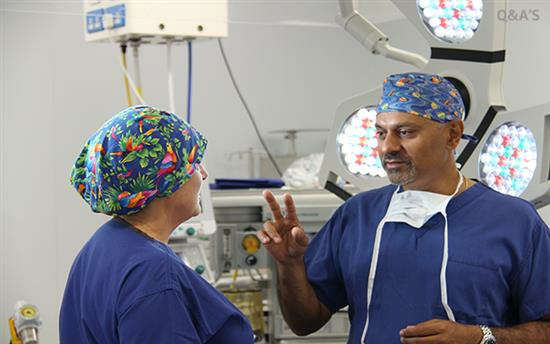 Patients consistently report that getting to know their surgeon makes a big difference to how they feel about the surgery and allows them to go into their procedure confidently and at ease.